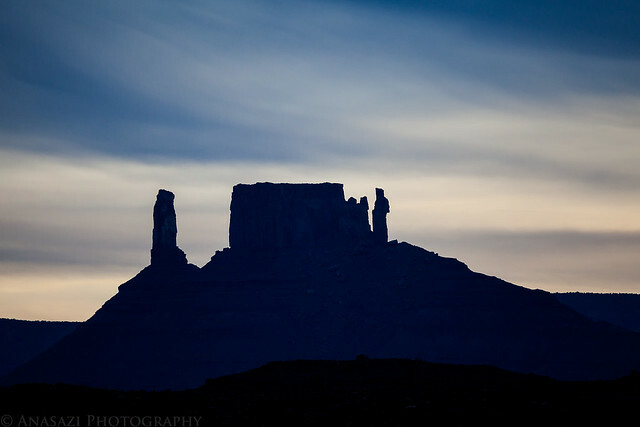 On Saturday I drove down to Moab to meet up with Marty again for some hiking and exploring. He’s going to be moving to Grand Junction at the beginning of the new year, so we wanted to get at least one more hike in before he got busy with the move. 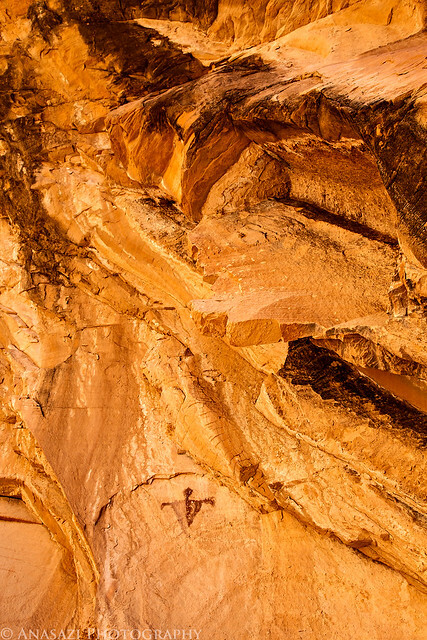 Over the last year Marty had come across some new rock art sites while out exploring the area, so today he was going to show me some of them. I managed to time my drive to Moab so that I was near the Fisher Towers at sunrise. 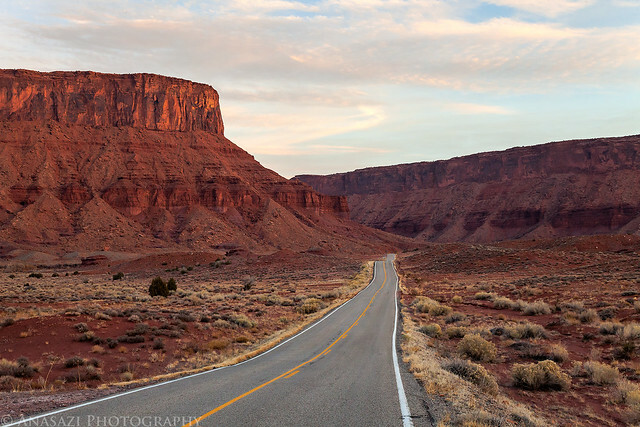 Highway 128 through the Richardson Amphitheater at sunrise. 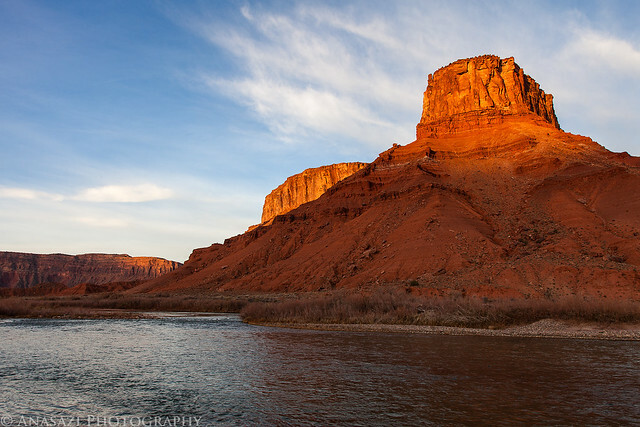 I stopped along the Colorado River as the early morning light was striking the cliffs on the other side. 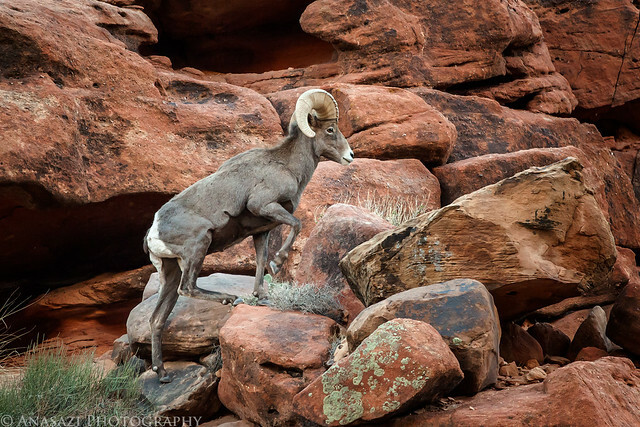 I’ve driven the River Road to Moab many times over the years and have never seen a bighorn sheep along this stretch before. That would change this morning since this guy was standing on the shoulder of the road as I approached. I pulled over and changed my lens to get this shot before he climbed back up into the cliffs to join the rest of the group. 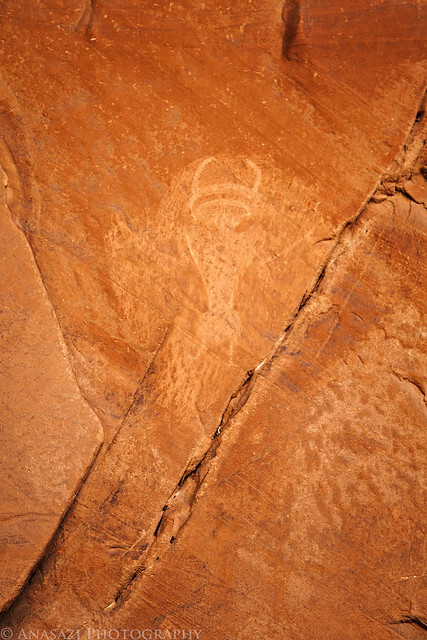 On our first hike of the day we came across this boulder with a few petroglyphs on them. While these look pretty cool, there is something about them that just don’t add up to me. 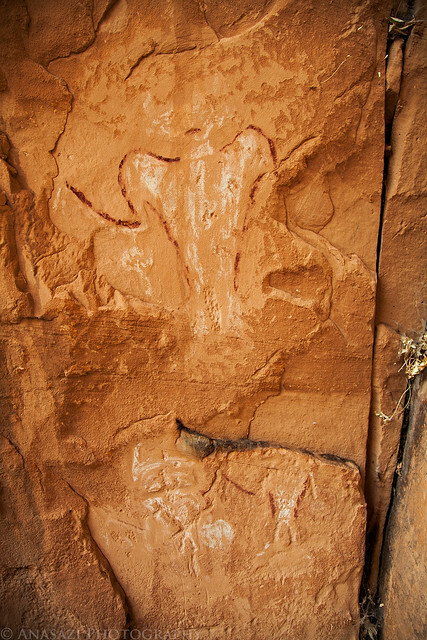 Not only did they look too ‘perfect,’ there were other figures pecked here that seemed to copy other figures found in the area, including a smaller but perfect replica of the ‘Moab Mastodon’ I’m far from an expert, but in my opinion these are not authentic. 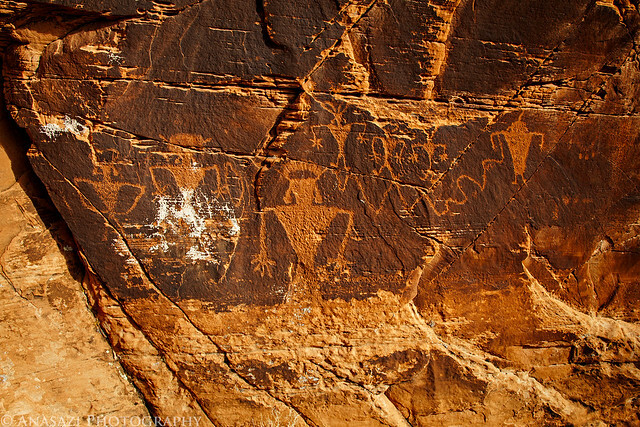 If anyone out there has seen these petroglyphs before and has an opinion, I’d love to hear it! 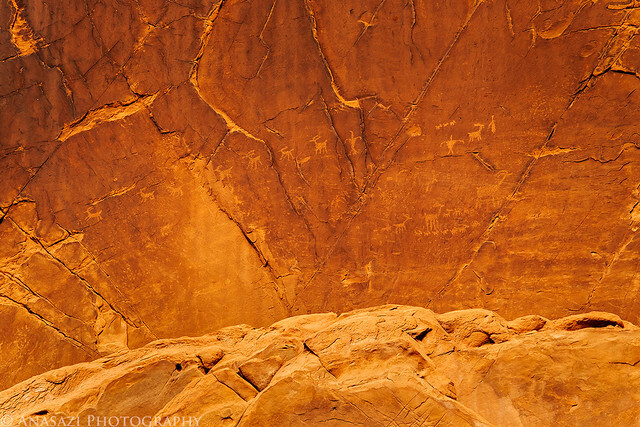 Next we hiked to a small pictograph panel that Marty had found a few months back. This figure was found nearby. 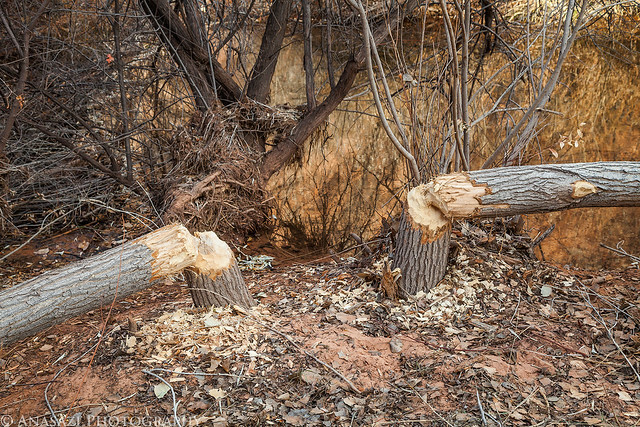 As we hiked along a creek, we came across this section that seems to have seen a lot of beaver activity lately. These are just two of the fallen trees we came across…there were many others. 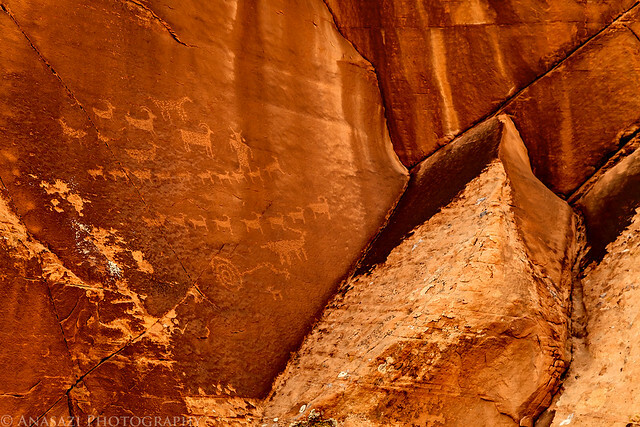 A small pictograph I’ve been to before, but the reflected light in this little alcove was amazing as we passed by this time. 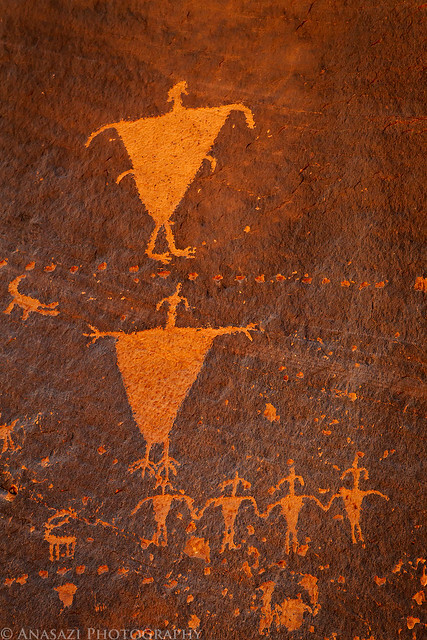 This is a nice big petroglyph panel I’ve stopped by before, but it’s always been hard to get a good photo of. 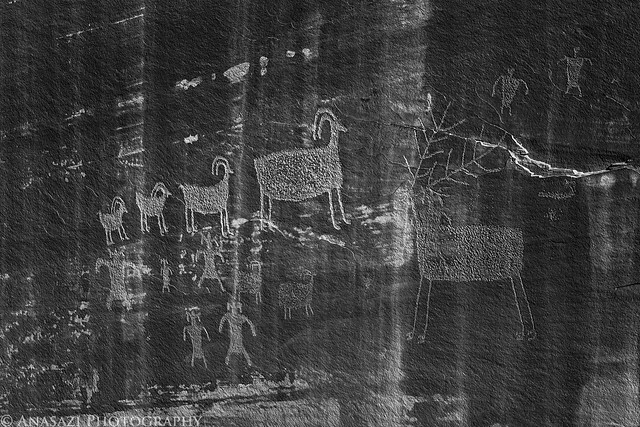 I think black and white helps bring out the petroglyphs a little better here. 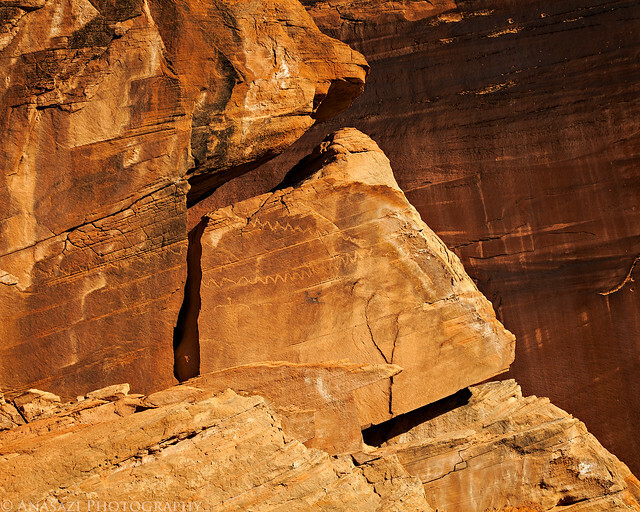 Look closely at this section of the canyon wall hidden behind some trees. There are some amazing figures here, but they sure do blend in well. These are even hard to see with the naked eye. 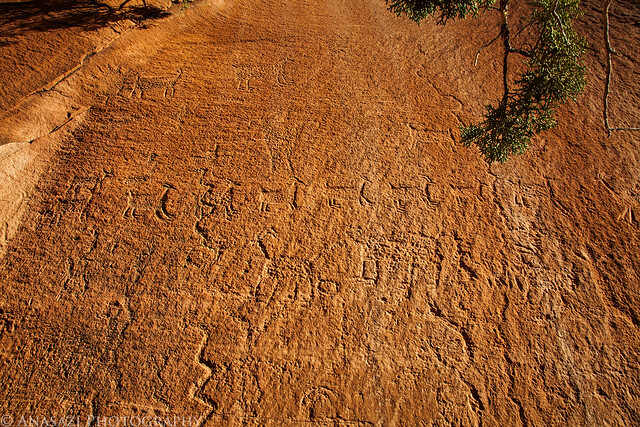 If you look at the carved squiggly lines on the broken piece of sandstone you can see that part of the line continues onto the main cliff, which means that this section broke off after the petroglyphs were carved here. I find that pretty interesting. 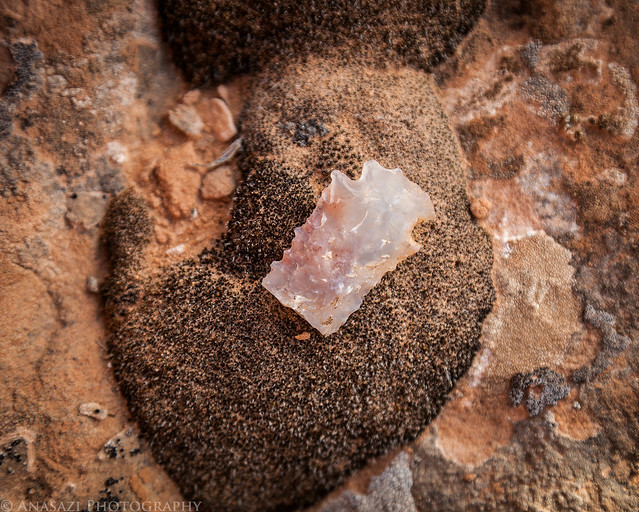 As we searched a new area for rock art, Marty found this point on the ground that was broken. 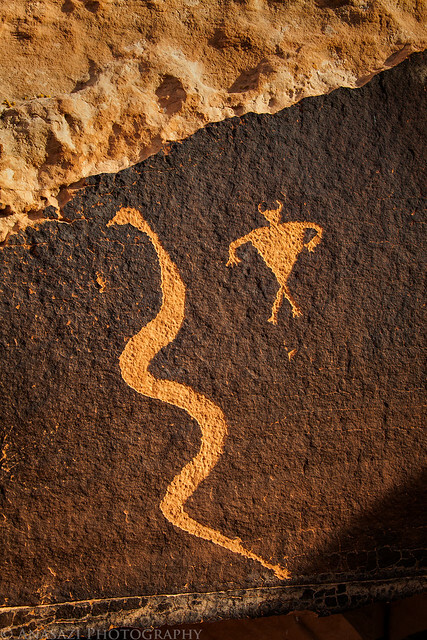 A very cool petroglyph panel that Marty found a while back. It’s amazing that I have been so close to this one before, but never even knew it was there. Here’s one that Marty missed, but I spotted this time. That’s why it’s always helpful to have a second pair of eyes. One last panel for the day, high up on a fin. There are a lot of different sized sheep on this one. 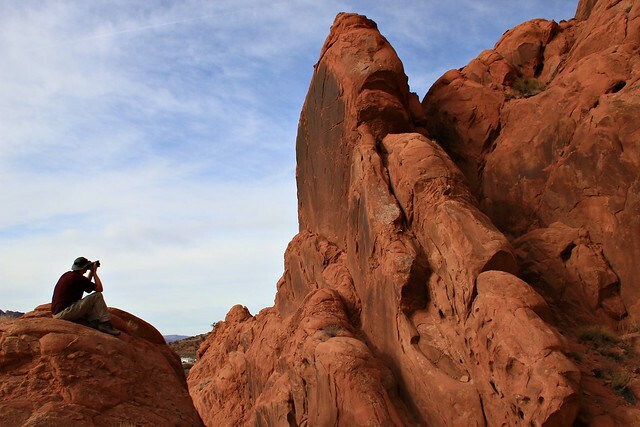 Marty took this photo of me taking a photo of rock art from the top of a fin. There was a big drop off in front of me and behind me, so I wasn’t too comfortable sitting up there! 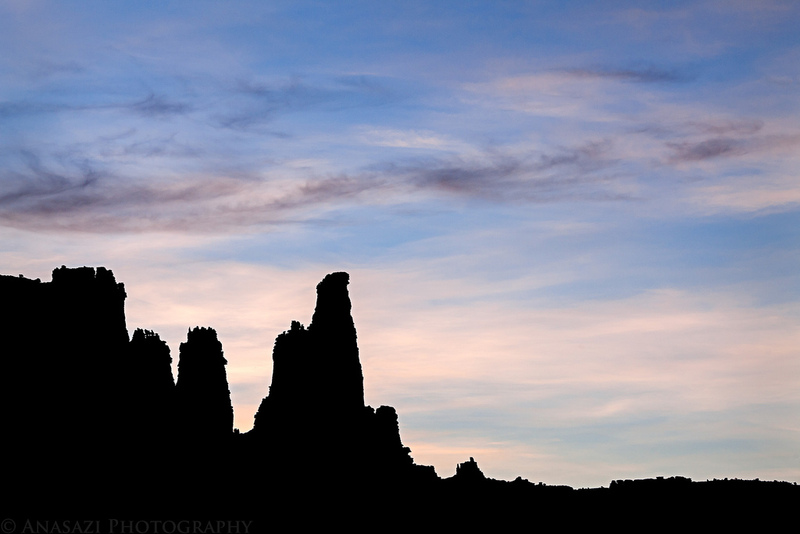 The Rectory and Castleton Tower after the sun set as I drove back home. 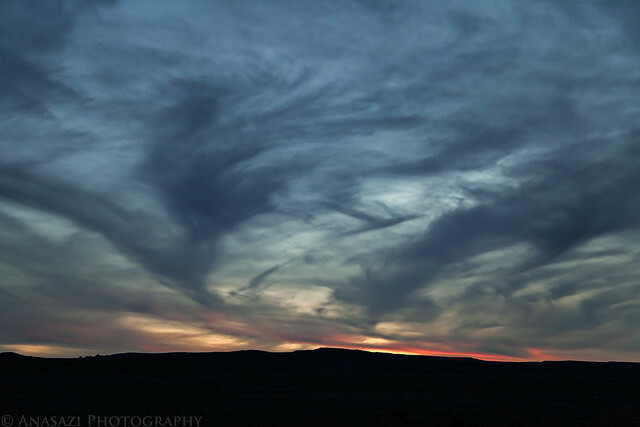 There wasn’t a lot of color during the sunset this evening, but there were some interesting clouds in the sky.